Risk roundup – Jay and Louise Norris of Colorado Health Insurance Insider host this week’s Cavalcade of Risk – it’s the Colorado nature edition. Congrats to the Norrises on their 5 year blogging anniversary and 10th issue hosting the Cavalcade. Check the facts – At Comp Time, Roberto Ceniceros tells the story of an insurer relying on a newspaper’s crime report as the basis for denying a claimant’s workers comp benefits. While this situation might seem like one that wouldn’t surface all that often, we’d make the case that it is a cautionary tale for anyone who is using social media as an investigative tool. Culture of Caring – Dave DePaolo has an interesting post on how the culture of caring relates to a workplace where the turnover rates are high, like fast food joints. Is high-touch communication and an early return-to-work model as effective when turnover is 120%? We’d note that high turnover is not only an impediment to return to work, it’s no doubt also a factor in the number of injuries that occur. New, untrained workers have more injuries. The Bureau of Labor Statistics data shows that more than 40% of work-related injury claims are filed by workers who have been on the job for 12 months or less, and a NIOSH study found that employees 24 years old or younger are two times more likely to suffer a nonfatal injury than their older co-workers. Medical Costs – In our last news roundup, we linked to the Kaiser Family Foundation’s recent report that average family benefits premiums are up 9%. Joe Paduda of Managed Care Matters offers his thoughts on why premiums are up so much when medical costs are flat. Workplace Violence – Michael Fox of Jottings by an Employer’s Lawyer posts about OSHA’s new directive on procedures for investigating workplace violence complaints. He notes that two industry groups get singled out for particular focus: Healthcare and Social Service Settings and Late-Night Retail Settings. 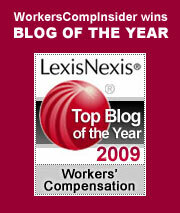 Anniversary of Patel Memo – At Lexis-Nexis, Robin E. Kobayashi commemorates the 10 year anniversary of the Patel Memo. Bonus points to you if you know what the Patel memo is. Here is a clue: it launched an entire workers comp-related industry. Case to watch – The EEOC is suing Texas-based BAE Systems for violating the ADA by firing a man who weighed 680 pounds. The man had worked at his job for 16 years and had logged good performance evaluations. The intersection of obesity and the ADA is one to watch. When light duty runs off the rails Safety News Alert discusses a case of a worker who returned to work on light duty. While on light duty, he received partial disability benefits because the job didn’t pay as much as his previous position. But the employee had trouble getting along with his supervisor and asked to be laid off – which the employer granted. The employee then applied for full work comp benefits. Check out the court’s decision. OSHA record keeping: what’s the difference between medical treatment and first aid?